Scope maker Tektronix Inc. says it has sold over one million of its TDS200 digital storage oscilloscope first released over two decades ago. To thank the engineers, technicians and students who have used these instruments, the company is now extending promotional offers that are detailed at www.tek.com/tek-one-million. Universities, technical institutes, and community colleges now use these scopes to teach electrical engineering and oscilloscope use to students. 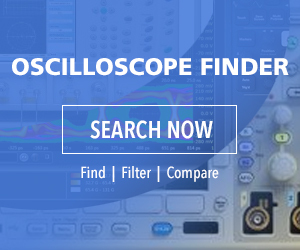 In consumer electronics, automotive, military and aerospace or medical device research, design engineers and technicians use value scopes to validate designs, isolate problems, debug serial bus issues and maximize power efficiency. In manufacturing, they are used for ongoing product testing or to repair manufacturing line failures. Hobbyists use them to test custom one-off circuit designs. The latest TBS2000 Series is well-equipped to meet today’s challenge. It features a 9-inch WVGA display with 15 horizontal divisions, allowing for more signal viewing area, 20-million-point record length, and up to 1 GS/sec sample rate. Users can seamlessly pan and zoom through long records with front-panel waveform navigation controls. The scope includes a set of 32 automated measurements. It can display up to six measurements at a time or take a “snapshot” of all the measurements for a specific channel. The exclusive HelpEverywhere function provides context for challenging menus. This function along with TekSmartLab compatibility and courseware ecosystem tools transform the TBS2000 into a powerful learning solution, giving students invaluable hands-on experience with the instruments they will be using throughout their careers. Available with a range of probes, the TBS2000 is the first of its kind with the TekVPI interface. It’s also backed by a five-year standard warranty. Prices start at $1,200.